WHITE PLAINS, N.Y. - A commuter railroad mechanic who was paralyzed in a deadly derailment said Wednesday that he forgives the man who was driving the train and is grateful to the railroad but is still suing for $100 million to protect his family. Samuel Rivera, 39, said he wasn't bitter or angry about his fate because, "Being upset and being bitter and angry isn't going to get you anyplace. ... Holding grudges is just not healthy." He spoke at a news conference at Burke Rehabilitation Hospital in suburban White Plains, north of New York City, where he is getting therapy. 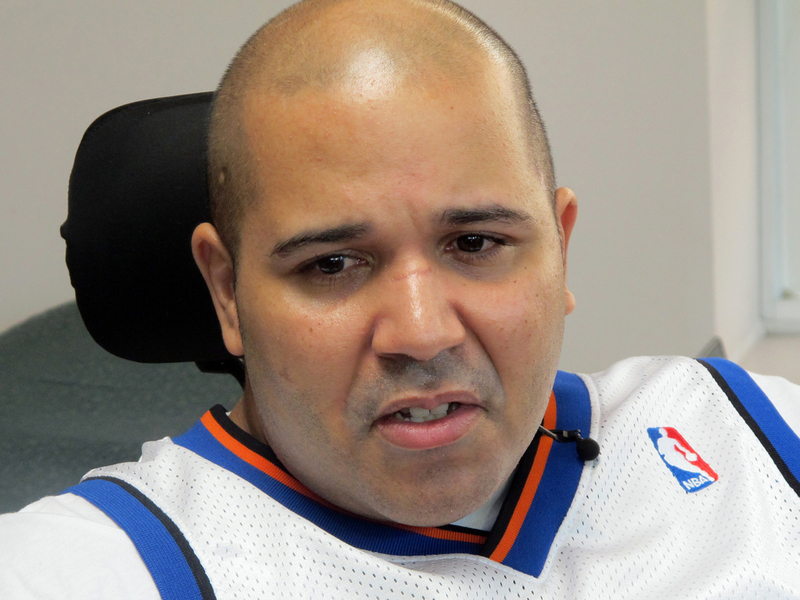 His doctor, Argy Stampas, said Rivera cannot move his legs or control his abdominal area. He has some use of his biceps and wrists but not his fingers. Rivera said that the day of the derailment, Dec. 1, was his day off and he and his 14-year-old son, Sam Jr., were heading into the city on a pleasure trip. The plan was "just hang out, maybe hit the Nike store, enjoy the city," said Rivera, who also has a 2-year-old daughter. He remembers that he was watching "The Walking Dead" on a portable device, and at one point looked up and thought, "Man, this train is moving fast." He also remembers coming to after the derailment and seeing his son, who was not seriously injured. "I remember telling him 'I don't think I'm going to make it,'" Rivera said, choking up. Four people were killed and more than 70 injured in the wreck. Investigators say the train was going 82 mph as it hit a curve with a 30-mph speed limit near the Spuyten Duyvil station in the Bronx in New York City. The engineer, William Rockefeller, told the National Transportation Safety Board that he felt "dazed" before the crash, and he has been diagnosed with a sleeping disorder. But no cause has been established and no charges have been filed. "I do forgive Mr. Rockefeller," Rivera said. "People make mistakes. I've made mistakes. ... His mistake ended up as a major tragedy." He spoke of his life before the accident, working on the railroad, Metro-North, and on his house, and about being a Raiders, Yankees and Knicks fan. He wore a Knicks jersey. Now, he said, he sometimes wakes at night and cries. "The fact that I can't walk and pick up my daughter is bad," he said. Rivera said he was grateful to Metro-North for "remaining by my side." His lawyer, Gregory Cannata, said the railroad was paying for extensive modifications to Rivera's house in Ossining to make it accessible when he goes home in a few months. Rivera said, "Any legal action I am taking against Metro-North is to protect my family's financial future. My care will cost hundreds of thousands of dollars each year." In the lawsuit, River and his wife, Jessica Rivera, allege negligence by Metro-North and its parent agency, the Metropolitan Transportation Authority. Jessica Rivera was at the news conference but would not speak. Cannata said no punitive damages are being sought in the lawsuit, which was filed Tuesday in state court in the Bronx. Rivera said he plans to push for a law mandating seat belts or other safety restraints on public transportation. Had there been seat belts on the train, he said, "Perhaps we would not be here today." Railroad spokesman Aaron Donovan said seven lawsuits have been filed over the derailment as well as 80 notices of claim, which are often precursors to lawsuits. He said he could not comment on Rivera's lawsuit because it is pending.